This summer has been a great time for me to work on improving my fitness and losing some weight. Although I have not gotten out to ride as much as I’d like, Wizard is happily enjoying his downtime in his paddock with his friends while I toil away, hiking in the woods of New Jersey. HOT, HOT, HOT! Since we were in the middle of a heat wave, I kept Wizard’s ride short and sweet. We took a short walk to the log cabin with Christie and Brigid, and then looped around and headed home. Brigid was back from a stay at the vet, and Wizard did a great job of riding quietly next to her while she enjoyed a stroll in the park. When we returned to the barn, I took him for a quick ride in the arena. He was warmed up from the walk, so we went right into some relaxed trot work across the diagonals, and then I surprised him with a canter transition on the right lead. And he surprised me with a PERFECT depart, followed by several strides of a really nice canter. YES!!! I rewarded him the best way I could, which was immediately hopping off his back and walking him back to be untacked and hosed off for an afternoon in the paddock with his horsey pals. Kris and Sunny joined Wizard and me for a trail ride. We covered 4.15 miles, riding out the long field and up to the edge of the woods past the lake. We took a quick loop around a wooded trail and headed back. Wizard was great- he’s been feeling really nice and relaxed on all our recent trail rides. Wizard and I rode with Sunny, Kris, Cathy, and Miss Tuesday in the outdoor arena. We didn’t have a lot of daylight, but we did some nice basic flatwork. I had a great lesson with Lisa. Before I got in the saddle, I showed her Wizard’s gaits on the longe line. 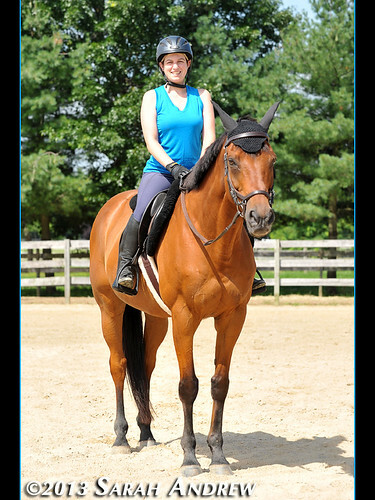 I wanted her to see how his canter looks when I’m not in the saddle. It was also a great opportunity to get some pointers on our long-line work. I longed him with two longe lines. The biggest thing we needed to work on was keeping the contact on the outside rein more stable. Wizard responded quite well to a correction at the trot when he got rushy, and it reminded me to start taking more contact, rather than throwing the lines at him (just like when I throw the reins at him). I don’t do him any favors by giving him fritzy rein contact. 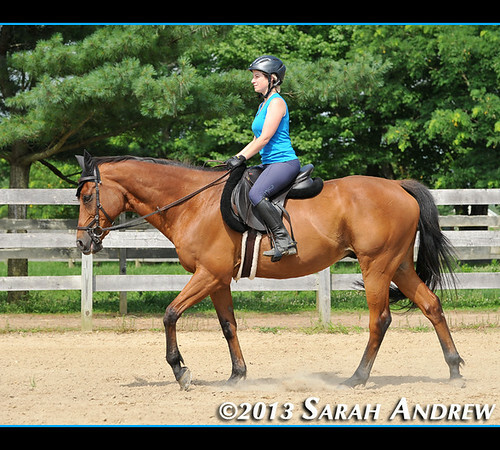 Under saddle, we worked on transitions, incorporating trot poles, walking, trotting, and a little work with rein backs. 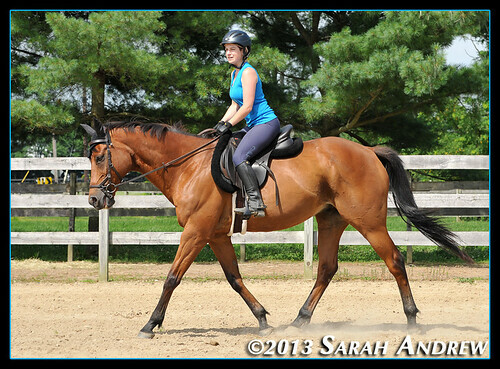 We did walk-canter transitions, as well as trot-canter transitions. Wizard got himself amped up once or twice, but it was a huge improvement over our last few cantering sessions. When I kept him straight, didn’t anticipate the movement, and kept MORE contact on the reins instead of less, he felt much better.